Smartphones have transformed clinical practice over the past few years. You use mobile apps to make better clinical decisions, to reference conversions and data, and to aid in physical examinations. But are your apps really evidence-based? Are they improving your practice of emergency medicine — or are they giving you unreliable information? 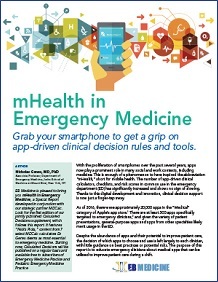 With the free mHealth in Emergency Medicine report, authored by emergency physician and informatics expert Dr. Nick Genes, you’ll learn how to evaluate which medical apps are well-researched and authoritative — empowering you to be both efficient and accurate at the point of care. Enter your email below to get instant access to this free report — as well as the first edition of Calculated Decisions. IS THAT MEDICAL APP WORTH DOWNLOADING? 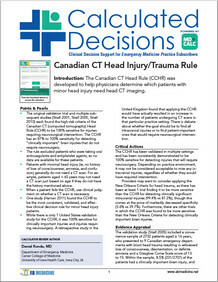 Along with the mHealth in Emergency Medicine, you’ll get a free copy of the first issue of Calculated Decisions, a new supplement for subscribers of Emergency Medicine Practice and Pediatric Emergency Medicine Practice from EB Medicine and MDCalc. This collection of specialized, in-depth calculator reviews will deepen your knowledge about the calculators you can reference through the MDCalc app. Calculated Decisions will help you harness the power of information and informatics to make clinical calls that are grounded in evidence and based on proven analytics and algorithms, all in context of best practices in emergency medicine. Enter your email to get instant access!